Severns & Bennett, pathfinders in Elder Law, published this guide for Preserving Assets, Dignity and Security in cases of Disability, Long Term Illness or Death. 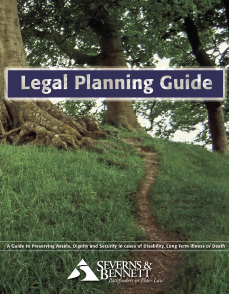 It provides an overview of various legal options that may be available to those seeking planning assistance. Lawyers who practice elder law dedicate themselves to learning the complex and interrelated issues that older adults and their families face with regards to trusts, durable powers of attorney, wills, advance directives for health care, and other techniques of estate planning to help families design contingency plans. This publication is meant only as a guide; each person or family’s circumstances are unique and must be evaluated individually. Competent legal counsel should be sought before taking any action.